David Ayer's End Of Watch has been hailed as one of the best cop buddy movies of 2012. And its indeed the right accolade for its much more than just another cop buddy film - intense, laced with grit, humor and shot in real life docu drama style. At the core of this film is respect for the people in uniform who take their life in their hands day after day and with each traffic stop, that could be their last. This applies to the good people in uniform the world over. A cop movie about honor, loyalty and the love of brothers literally but in this film two men not related but brothers all the same. 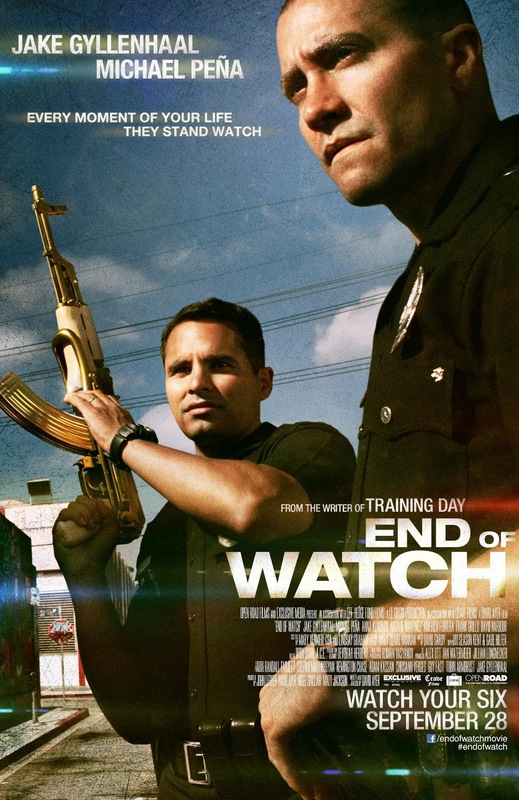 End Of Watch tells the story of two LAPD patrol officers who stumble onto a house taken over by a Mexican drug cartel that has a horrifying discovery. This bust lands both officers on the hit list by the cartel. Brian (Jake Gyllenhaal) and Mike (Michael Pena) are the two officers and their banter which to my understanding had some parameters written by Ayer (Training Day) but that most of their dialogue was ad libbed and it comes out as sheer genius. Not only is the dialogue spoken realistically but whatever Ayer's contributions were also were effective - the two stars and Ayer know they do not have to oversell their material and they don't. So everything else that flows from this story seems so real and so intense you will be glued to your chair, eyes fixated on the screen. This is a terrific but BRUTAL film. It has been ranked as 6th all time with curse words that begin with F and the violence seems very accurate to what the police have to contend with. Not only is the acting by Gyllenhaal and Pena superb but even the Mexican gang (that is literally gunning for the cops) give an outstanding performance. The actors really seem right for their parts, more so than a lot of similar films bad guys. I mean, after all, these films are only as good as their bad guys. The good guys we KNOW have to be good. But for us to really care about the heroes we have to REALLY hate the bad guys, and you will positively HATE THEM. Good review. It’s not the most original piece of work out there, but the chemistry and characterization between these two is what really kept it fresh and exciting and had us invested in what happened to these guys.